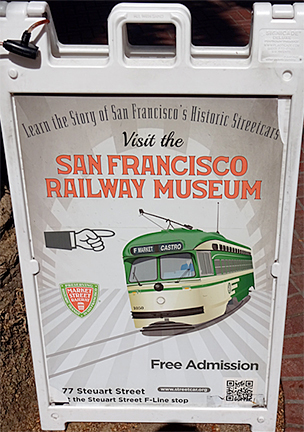 It would make sense to call this museum the "San Francisco Streetcar Museum" even though the street cars, also known as trams or trolleys, belong to the San Francisco Municipal Railway. They do qualify as trains, however, in that their steel wheels roll on steel tracks. Streetcar from Milan, Italy, 1920s. 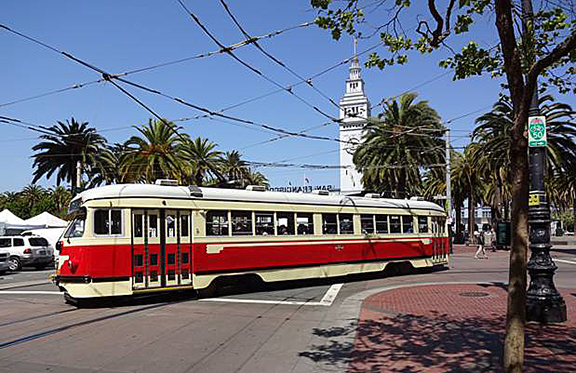 In 1892, streetcars began service here in San Francisco, replacing steam trains, horse drawn carts, and some cable cars (which had been running here since 1873). 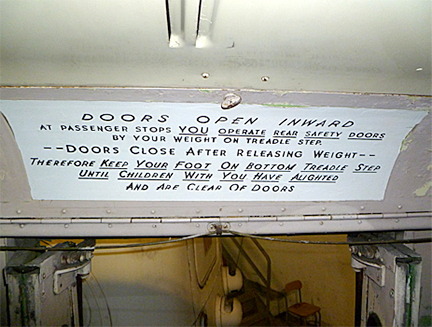 An on-board sign from the 1950s warning of the dangers of stepping off a trolley car. 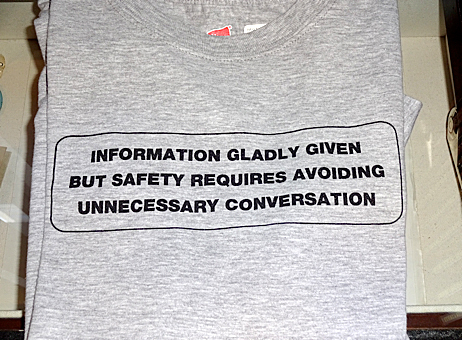 A copy of an actual tee-shirt worn by motormen to discourage chit-chat is for sale here. 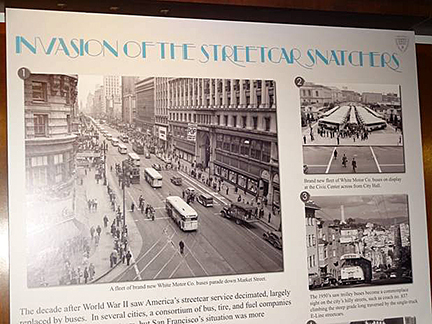 The current display is called ‘”Car vs. Car” with photos showing how automobiles impacted streetcars (literally!) showing what happens when autos or trucks challenge streetcars. The sturdy streetcars usually survive with little damage, but not so the unfortunate wrecked vehicles. One photo shows a crumpled automobile lying on its side next to a trolley. 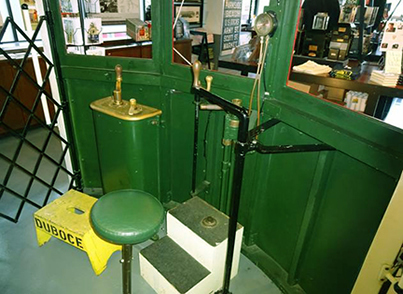 where visitors can stand at the controls and play motorman. Large colorful wall calendars along with a collection of books, tee-shirts, posters, postcards, and other souvenirs are for sale here. 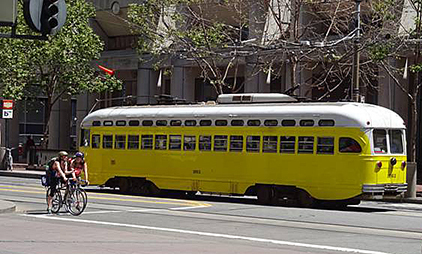 When World War II started, many of the conductors and motormen were drafted into the armed forces, leaving the San Francisco Municipal Railway short-handed. While previously they had hired only white males, this crisis forced Muni to change their requirements. Thus women and people of color were eventually considered eligible. A true pioneer in this change was a determined, 15-year-old Maya Angelou. "They turned me down, even though I lied about my age and said I was 18,” she remembers. “I really needed a job. I went back every day and sat in the employment department and kept asking. Finally they hired me as a conductor." The city boasted fifty streetcar lines in the 1920s, but by 1982, there were only five lines remaining. They were run underground subway style. The other 45 lines were downgraded to “modern” motorcoaches. But San Franciscans are proud of their history—they like to keep it visible. A non-profit volunteer group, called the Market Street Railway, stepped in 1983. Their mission was and continues today to educate the public to the value of historic transit. 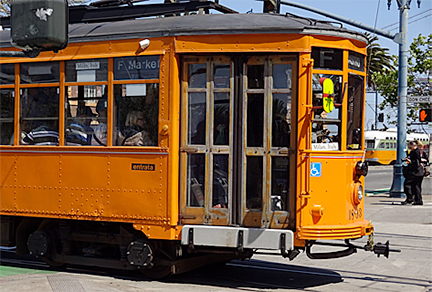 Mayor Dianne Feinstein, Muni, and local leaders arranged the Historic Trolley Festival which brought streetcars in from other cities and countries to run on Market Street, which they still do. The most popular streetcars came from Blackpool, a coastal resort in Great Britain. 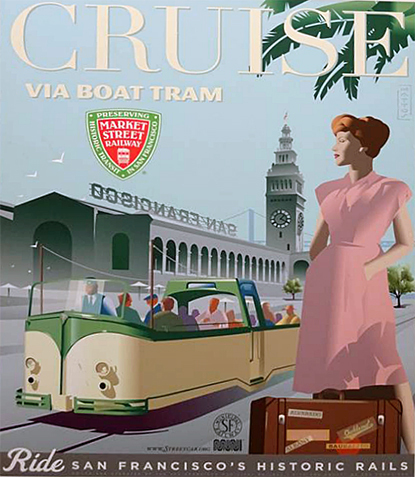 These 1934 open-to-she-sky vehicles are called Boat Trams. One is in service now; another is under repair. 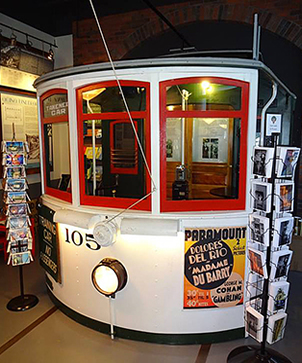 The Railway Museum is located on the corner of Steuart Street and Don Chee Street, just one block off The Embarcadero and across from the Ferry Building. It is an excellent spot from which to watch these streetcars at work as they turn from Steuart Street onto Don Chee Street, providing various angles appropriate for photographing. Admission is free. The museum is open Monday through Sunday 10:00am to 6:00pm, but closed Mondays during winter months. NAMED ONE OF THE WORLD'S TOP TRAVEL SPECIALISTS BY CONDE NAST TRAVELER MAGAZINE SINCE 2002. Please visit http://www.traintravelconsulting.comor email sylvia@traintravelconsulting.com, or phone 541-887-6025.